This is a behind the scenes look at the Falling Apart premiere that happened on June 15th 2005. 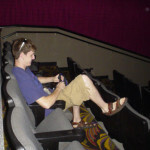 Steve and I headed out to the Main Art Theatre to test the DVD and make sure everything looked good for the premiere of the feature film later that night. Everything went great and we had a packed house (176 seats). The best night of my filmmaking career. Thansk to everyone who came out. 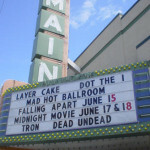 A big Thank You to everyone who came out to see Falling Apart for it’s official premiere at the Main Art Theatre in Royal Oak on June 15th 2005. All of us here at Scape Films were amazed with the turn out. Our numbers aren’t officially in yet but we nearly (if not did) sold out the theatre. There were 176 seats and everyone we talked to that was there said they couldn’t see an empty seat in sight. The theatre was filled with a lot of energy and people were in an overall happy mood. Very glad to see that. It was a fun movie to make and a fun movie to premiere. Lets hope the same energy carries over into the DVD release. This was our first feature so it’s wonderful everything turned out so great. Once again Thank You to everyone.